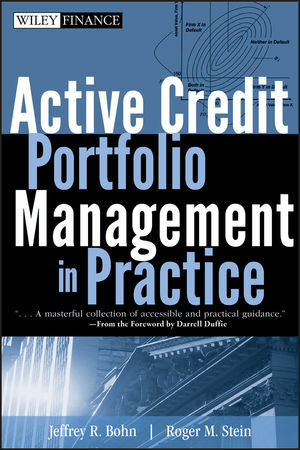 Filled with in-depth insights and expert advice, Active Credit Portfolio Management in Practice serves as a comprehensive introduction to both the theory and real-world practice of credit portfolio management. The authors have written a text that is technical enough both in terms of background and implementation to cover what practitioners and researchers need for actually applying these types of risk management tools in large organizations but which at the same time, avoids technical proofs in favor of real applications. Throughout this book, readers will be introduced to the theoretical foundations of this discipline, and learn about structural, reduced-form, and econometric models successfully used in the market today. The book is full of hands-on examples and anecdotes. Theory is illustrated with practical application. The authors' Website provides additional software tools in the form of Excel spreadsheets, Matlab code and S-Plus code. Each section of the book concludes with review questions designed to spark further discussion and reflection on the concepts presented. JEFFREY R. BOHN, PHD, leads the Financial Strategies group at Shinsei Bank in Tokyo. Previously, he led Moody's KMV's (MKMV's) Global Research group and MKMV's Credit Strategies group. After Moody's acquired KMV, he and Roger Stein coheaded MKMV's research and product development. ROGER M. STEIN, PHD, is Group Managing Director of the newly formed Quantitative Research and Analytics group at Moody's Investors Service in New York. Previously, he was head of research for Moody's Risk Management Services. After Moody's acquired KMV, he and Jeffrey Bohn co-headed MKMV's research and product development.